This data set provides environmental and vegetation data collected between 1978 and 1981 from 439 study plots at Arrigetch Peaks research site, located in the Gates of the Arctic National Park and Preserve in the Endicott Mountains of the central Brooks Range, Alaska. Plots varied between 1 and 50 square meters in size and were located in 13 broad habitat types across the glaciated landscape. Environmental data include aspect, elevation, and cover of bare soil, rock, soil crust, and litter. Species data are described according to the Braun-Blanquet system. This product brings together for easy reference all the available information collected from the vegetation plots in the Arrigetch Peaks region of Alaska. The data set includes 2 data files in *.csv format. 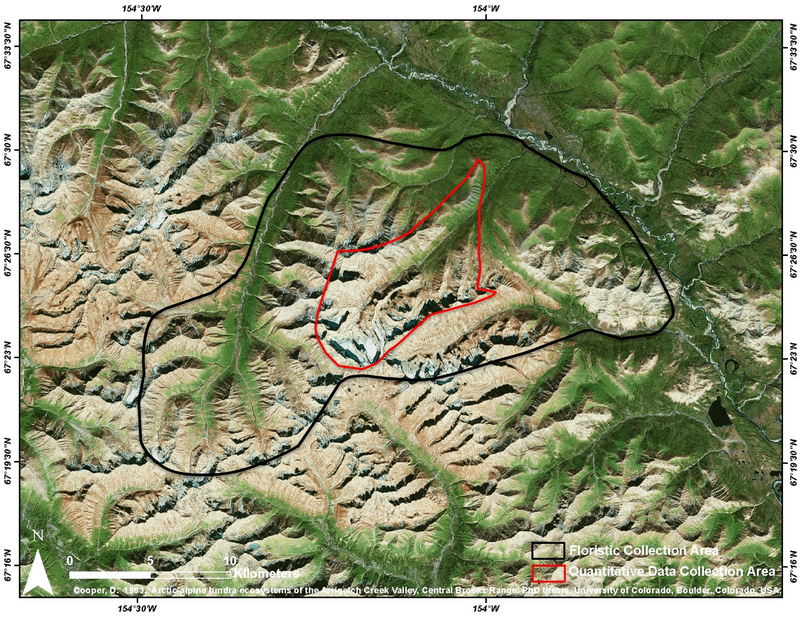 This data set provides environmental and vegetation data collected between 1978 and 1981 from 439 study plots at Arrigetch Peaks research site, located in the Endicott Mountains of the central Brooks Range, Alaska. Plots varied between 1 and 50 square meters in size and were located in 13 broad habitat types across the glaciated landscape. Environmental data include aspect, elevation, and cover of bare soil, rock, soil crust, and litter. Species data are described according to the Braun-Blanquet system. This product brings together for easy reference all the available information collected from the plots in the Arrigetch Peaks region of Alaska. The Arrigetch Peaks are located in the Gates of the Arctic National Park and Preserve. The Pre-ABoVE vegetation plot datasets were curated to create the Alaska Arctic Vegetation Archive (AVA-AK; Walker et al. 2016b, Walker 2013). The AVA-AK is a regional database that is part of the larger Arctic Vegetation Archive (Walker 2016a, Walker et al. 2013, Walker and Raynolds 2011). The database contains vegetation plots from homogeneous plant communities with tables of cover or cover-abundance scores for all species and accompanying environmental site data. Field data were collected using Braun-Blanquet, US National Vegetation Classification protocols, or comparable methods. The Arctic-Boreal Vulnerability Experiment (ABoVE) is a NASA Terrestrial Ecology Program field campaign that will take place in Alaska and western Canada between 2016 and 2021. Climate change in the Arctic and Boreal region is unfolding faster than anywhere else on Earth. ABoVE seeks a better understanding of the vulnerability and resilience of ecosystems and society to this changing environment. These data files were edited by Donald A. Walker, Amy L. Breen and Lisa A. Druckenmiller at the University of Alaska Fairbanks' Alaska Geobotany Center and obtained via the Arctic Geoecological Atlas (http://arcticatlas.geobotany.org/), which provides access to existing Arctic vegetation plot and map data in support of the ABoVE campaign. The data set includes two data files in *.csv format -- Arrigetch_Peaks_Environmental_Data and Arrigetch_Peaks_Species_Data. Data Descriptions: The columns names, their units, and descriptions for each of the *.csv data files are listed below. 4 to 442 AUTHOR_PLOT_NUMBER (between 3 and 602) Column headings are plot numbers recorded by Cooper (1983). The data values are Species Cover Classes (Braun-Blanquet cover-abundance scale): where r (rare), + (common, but less than 1% cover), 1 (1-5 percent), 2 (6 to 25%), 3 (25 to 50%), 4 (51 to 75%), 5 (76 to 100%). Derived regional maps of these data will be used in regional models of fluxes of trace gases, water, and energy from tundra surfaces. In addition, a circumpolar vegetation classification resulting from these data sets would be highly desirable to extend the results to the entire arctic region. No specific quality assessment information provided. The vegetation of Arrigetch Peaks was described and mapped by David J. Cooper for his PhD thesis (at University of Colorado) funded by the National Park Service. Located in the Endicott Mountains of the central Brooks Range, the vegetation of the Arrigetch Peaks is uniquely influenced by both latitude and altitude (Cooper 1986). A reconnaissance of the area was completed in 1976, while most of the data were collected between 1978-1980. The primary source documents for this data set are a PhD thesis (Cooper 1983) and a research paper (Cooper 1986). Both the author's determination and the current taxonomy according to the Panarctic Species List (PASL) are listed. Taxa are listed in alphabetical order according to the accepted PASL name. Species cover classes are in percentage. In one instance, taxa were lumped into a single taxon in the PASL: 1) Cladonia stellaris (Cladonia stellaris and Cladonia aberrans). Species data are presented for 439 plots which include 5 orders, 10 alliances, and 49 associations that are described according to the Braun-Blanquet system (Westhoff and Maarel 1978). Plots were located in 13 broad habitat types including: aquatic wetlands (5 plots), wet tundra (17 plots), wet and late-lying mostly mossy snowbed communities (11 plots), moist to wet riparian shrublands and subalpine scrubland (59 plots), moist to wet alder shrublands (13 plots), moist to wet acidic dwarf-shrub tundra (58 plots), moist to dry low-shrub tundra on south-facing slopes (6 plots), moist nonacidic graminoid-dominated tundra (22 plots), dry graminoid and forb dominated communities (109 plots), dry acidic dwarf-shrub tundra (13 plots), dry dwarf-shrub snowbed communities (84 plots), dry to wet barrens, pioneering communities, crevice communities (28 plots), and other communities-Saxicolous lichen communities and moss communities on acidic rocks (17 plots). slope was entered as 0 where aspect was marked as -9999. The size and shape of each plot was not standardized and plots were not permanently marked. Minimal areas of various communities were calculated using standard methods (Westhoff and Maarel 1978). Areas for communities dominated by cryptogams were 1 to 4 square meters, for grassy open communities plots were 16 to 36 square meters, and for communities with very widely scattered shrub coverage, plots were up to 50 square meters. Accurate geolocations for plots are not available, however a map of the study area (Cooper 1983) is presented in Figure 1. Environmental data collected include aspect, elevation, and cover of bare soil, rock, soil crust, and litter. This data set was provided by the GINA repository at http://geobotanical.portal.gina.alaska.edu/catalogs/10177-alaska-arcticvegetation-archive-arrigetch-peaks; access date 24 October 2016.
Cooper, D. J. 1983. Arctic-alpine tundra ecosystems of the Arrigetch Creek valley, central Brooks Range, Alaska. PhD thesis, University of Colorado, USA. Cooper, D. J. 1986. Arctic-alpine tundra vegetation of the Arrigetch Creek Valley, Brooks Range, Alaska. Phytocoenologia 14:467-555. Westhoff V, E. Van Der Maarel. 1978. The Braun Blanquet approach. In Whittaker, R. H. (ed. ), Classification of Plant Communities. The Hague: Junk, 297–399.